Ever wish you could figure out a better way to keep your house clean on an ongoing basis? I definitely do! 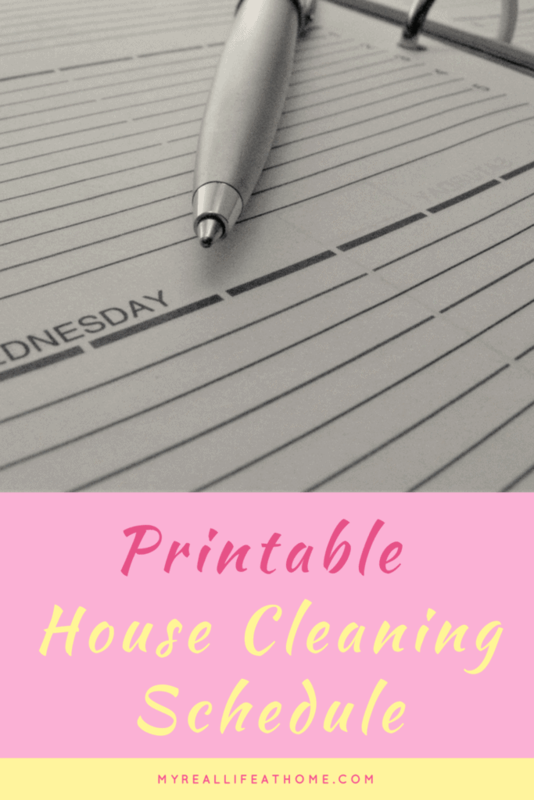 I have definitely struggled with this but I have found that if I have a house cleaning plan, I do much better and am more likely to stick with it. 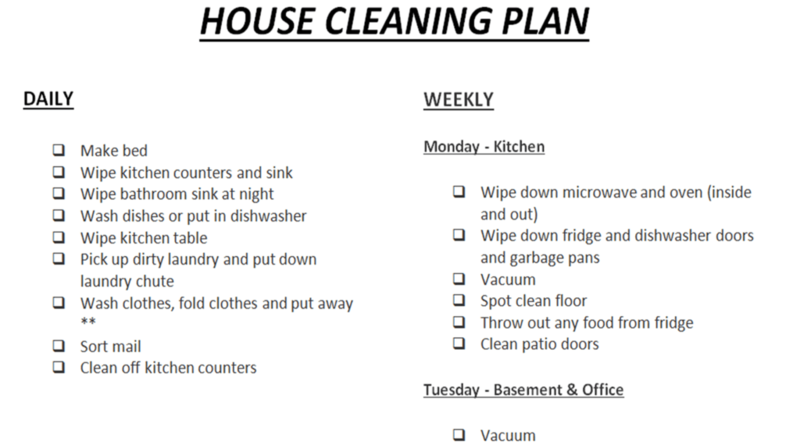 I am going to walk you through what I came up with for my cleaning plan. You will probably need to alter it to fit your home and schedule. First, I wrote down all the tasks that I needed to get done. You can be as specific or as vague as you want. However, I find that the more specific I am, the more likely I am to accomplish more. If you are vague, you could look at a room, pick a few things up and think “that looks good enough”. I discovered that if I have it broken down into every task or area that needs cleaning in that room, I will do the listed tasks. Next, I decided how I wanted to break up my schedule. Did I want to do break it down weekly, monthly, etc or did I want to break it down further into day-by-day? Again, I found that if I have a daily schedule, I would accomplish more and I found it easier to get into a routine. Also, if I got off track (which I have done many times), I could start back at any time and just go with it. Even if it was a Wednesday and I realized I needed to get back on schedule, I would just start on Wednesday. I have tasks that I do every day and then I have tasks that I do once a week but on a scheduled day. I also have monthly and quarterly but figure out what your time schedule is and what works best for you. Since I am a stay at home mom, I am able to do most of my cleaning during the day throughout the week. If you work out of the home, you may have to adjust to doing a few more tasks in the on the weekend depending on how much energy you have in the evening. That being said, each day’s tasks really do not take that long. I always think in my head that it will take longer than it actually does probably because I am not a fan of cleaning. It seems like I have that discussion with my 9-year-old every week when I ask him to clean his room. He complains because he says it will take all day but in reality, he’s done in less than 30 minutes. I guess I should listen to my own advice. It really doesn’t take that long if I get focused and just get it done. ** Depending on how much laundry you have in your home, you may not have to do this every day but put it in your mindset so that you don’t get behind. If you are looking for laundry tips, you can visit my Best Laundry Tips post. As I said, I have my weekly tasks broken down into each day. I have found this works best for me since it balances out my week and allows me to not have to be cleaning all day long. This may not work for you because of your work schedule or family commitments and that’s okay. Keep trying different schedules until you find one that works for you. These are tasks that I still need to keep on top of but I don’t need to do every week. On a certain week in the month, I do these chores in addition to my regular weekly chores. There are some other chores that the kids are in charge of so you won’t find them on your list. I struggle sometimes with what they should be responsible and I know they could be doing a lot more than they are. Some of the things that are not on my list that you may need to add are un-load the dishwasher, clean the toys in the basement and feed the dog. Again, these are my chores and what schedule works for me. Customize it so that it fits your schedule, needs, and home. I think you will find that after a couple weeks, you will find you are spending less time cleaning. 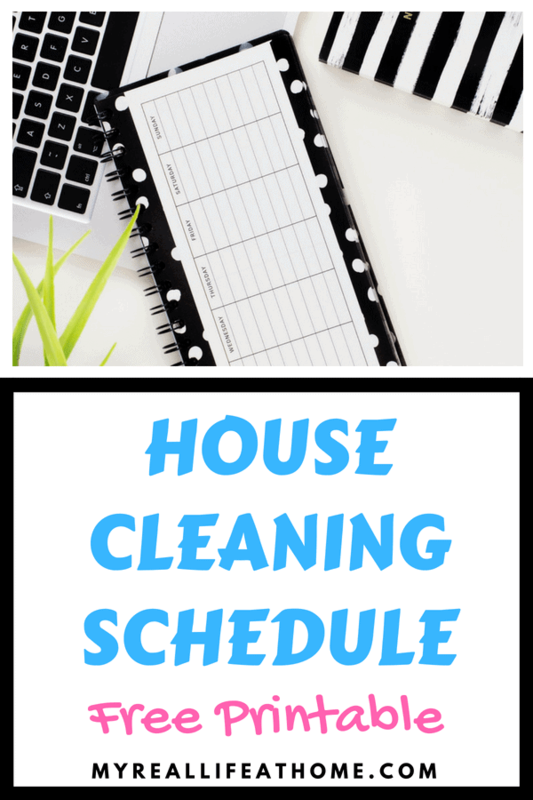 Don’t feel like your cleaning schedule is set in stone. You may realize that there are tasks that you need to add to your list or that you don’t need to do some chores every week. Keep changing it until it suits what you need and if you enter a different stage of life, it will probably change again. As you stay on top of everyday cleaning, you will find that it gets easier. Not only will you get into a routine and it won’t seem so daunting but you will find that you have less big messes to clean up. Those are the messes that always derail me and want me to just look the other way. Just so you know, those days will still happen especially after special occasions or parties. That’s okay! I don’t try to clean it all in one day. Just follow your schedule and it will be back to clean in no time. If it helps, you can find a copy of my free cleaning schedule. I would love to hear if this helped you! 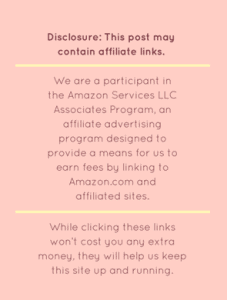 If you have any questions, please ask them in the comments below and I will get back to you. I love your list! I really need to do this. I am trying to form new routines now that my kids are in school. So glad you like it! I find that I do so much better when I have a plan. I love how thorough your list is, definitely something that I could use! Thanks for the tips! This is needed so much. If we can get the concept of doing the little things daily helps to keep it from being overwhelming! Absolutely. 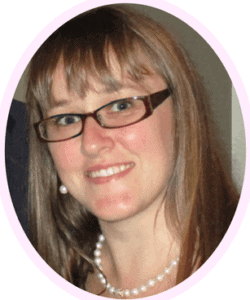 It the tasks ahead seem manageable, it is easier to stop the overwhelm from setting in. Love your list and the encouragement you share. 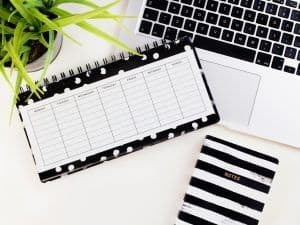 The schedule can definitely seem overwhelming at first, but once you find one that works for you and your family, it definitely gets easier over time. Pretty soon you won’t even have to think about it – you’ll just know that on Mondays you need to do x,y, and z, and so on. Great post! Exactly. Also, I think once routine sets in, the chores don’t seem to take as long to accomplish. Yes! I need cleaning lists! We moved into a brand new house a few months ago and I swore I was going to stay on top of cleaning, but here we are… as I’m commenting I’m dreading the toilet that has pee on it from my boys that I need to clean up, and the cluttered toy room… haha. Thanks for these great ideas! This is a great idea. 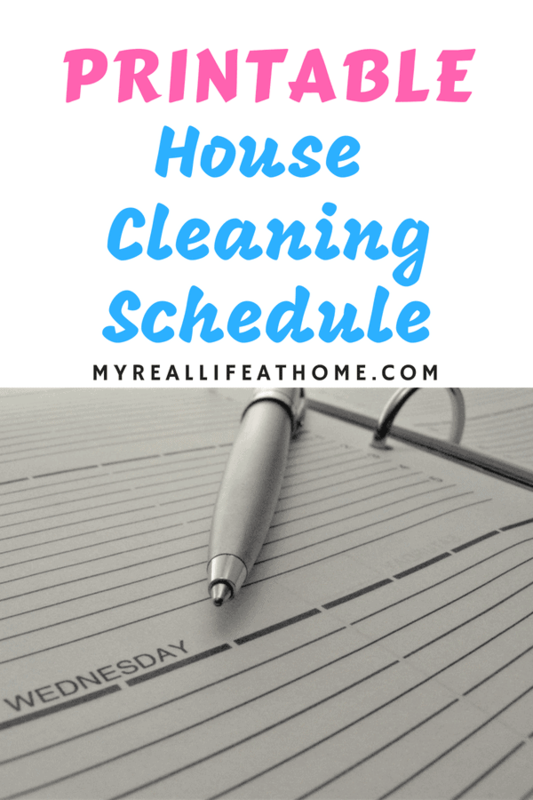 I cleaned houses for a living for a while and we definitely kept to a cleaning schedule. For me having a list makes it simple and easy to keep track of what needs to be done on which day. Kind of like I bake on a certain day for the entire week. Exactly! That’s awesome that you bake on one day for the week. That’s inspiring to me. Perfect timing with kids getting out of school and me needing to be more organized while they are home. Thanks! I pretty much follow this schedule but going to try yours exactly to see how it goes! 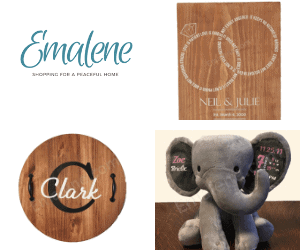 Let me know how it works but don’t be afraid to customize to your needs and home. Great ideas! I need to make a schedule like this!!! I’m so so bad at getting ours done!